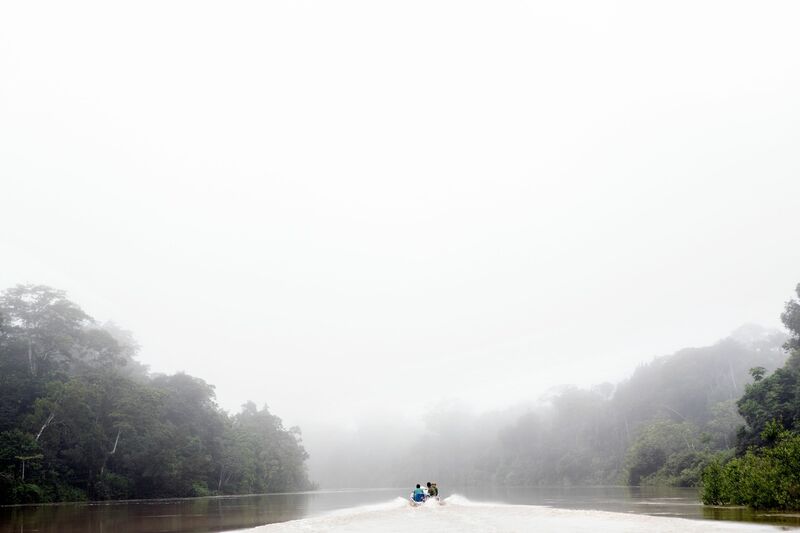 FUNAI team members travelling up the Rio Itui after the expedition to discover traces of uncontacted people within the reserve. Korubo Chief Takvan Korubo sits fireside with his tradition hunting stick during the FUNAI expedition. Members of the Korubo Tribe wave off the FUNAI expedition team as it sets off down the Rio Itui towards the Marubo village of Rio Novo where it will collect two Marubo tribes people before heading out on the expedition to locate the movement of uncontacted people in the Vale do Javari. Pictured in the canoe are Vunpa Korubo (left) and Kunu Korubo (right). 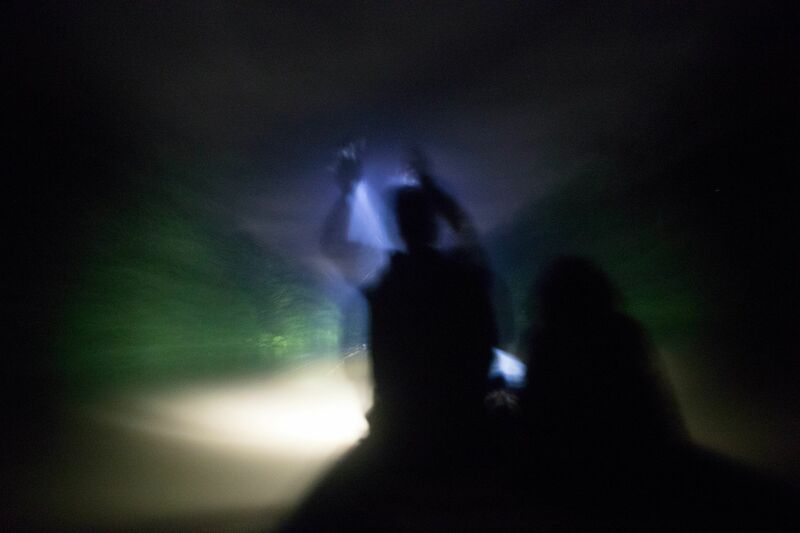 Funai expedition boat heading down the Rio Itui by torchlight. 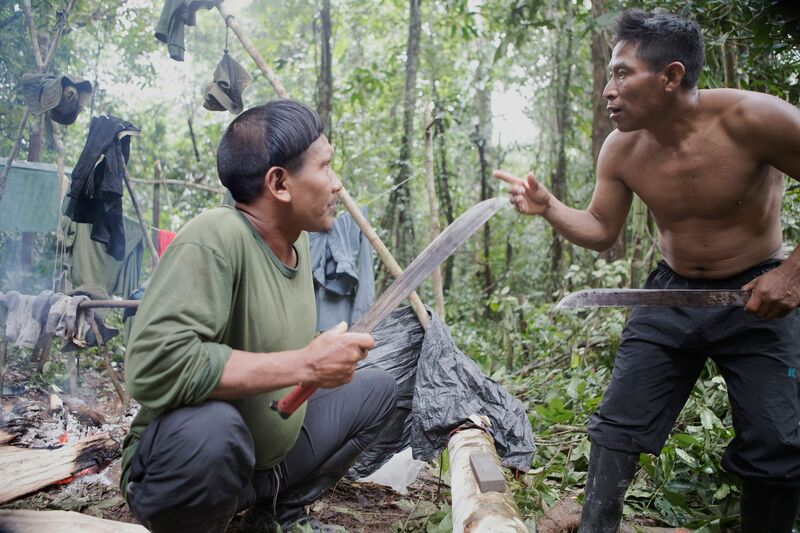 Takvan Korubo (left) and Daniel Mayaruna, 44 sharpen machettes before heading out on the first days expedition in the Vale do Javari. 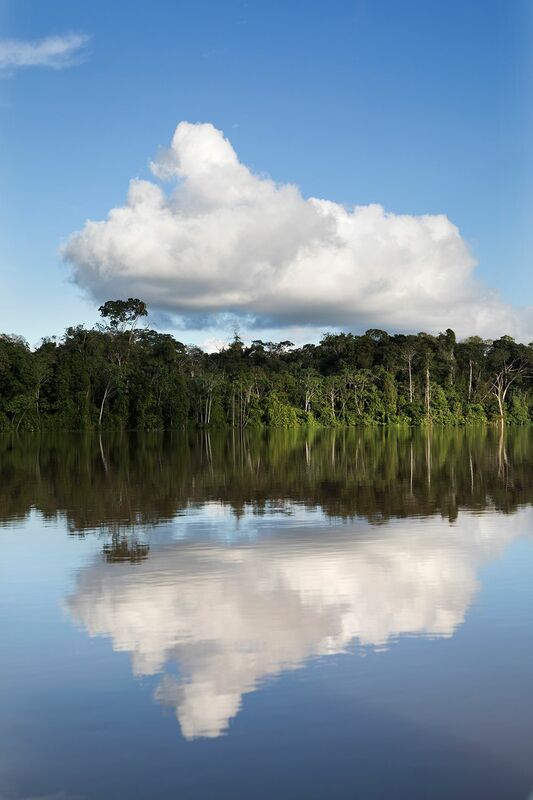 The expedition was looking for traces and evidence of uncontacted people within the area. A young Korubo women Wio carries her child Manisvo through to their village towards her Moloca. 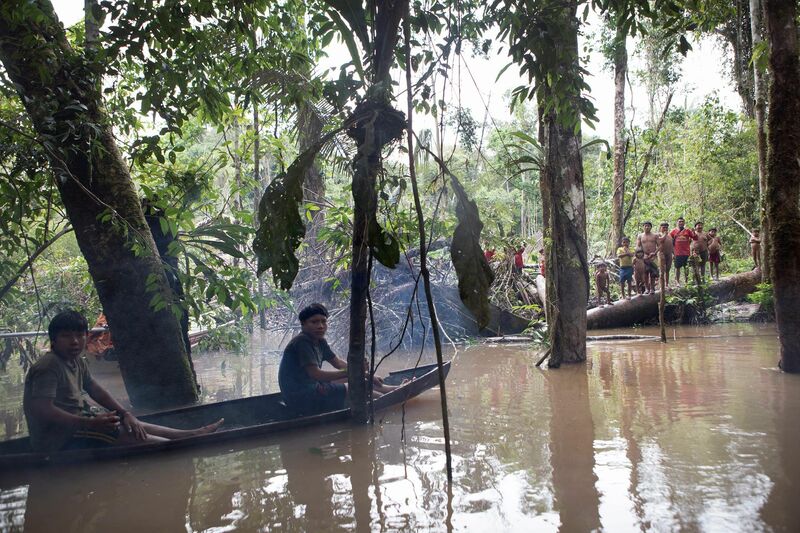 After 60 kilometres of tracking through the Amazon Xikxuvo Vakwë, 12, watches on as the boat to collect the Funai expedition team arrives at an opening along the Rio Itui ready to collect the team and return them to the Marubo village of Rio Novo. Young Marubo boy Metsisi Marubo carrying water from the Rio Itui toward the village of Rio Novo. Young Korubo boy Txipu Wanka with his pet monkey. Marcir Ferreira (49) helps clear the Rio Sapota from fallen trees which were obstructing the passage up Rio Sapota and the start of the FUNAI expedition tracing the movements of uncontacted people within the area. Members of the FUNAI expedition team clear the fallen tree which was preventing the navigation up the Rio Sapota towards the starting point of the expedition to trace the movements of uncontatced people. After cutting into the fallen tree for 1 1/2 hours team members stood on the tree to finally move it. The tree broke and the team members crashed into the river. Expedition leader, Bruno Pereira (38) explaining the route and the security of the group during the expedition. The group were to walk in a particualr order (armed members at the front and back) should they come across uncontacted people they were to stand still keep together and will try to communicate with the people. Josimar Marubo one of the expedition team members and person who spotted the first evidence of uncontacted people moving through the area. His village had been raided in the previous month ( March 2018), by two uncontacted men. They stole machetes and food from the village. After documenting the first evidence of movement through the area by uncontacted people FUNAI official and leader Bruno Pereira direct members of the team to search various location in the area for more signs of movement. FUNAI official and leader Bruno Pereira . 1 1/2 hours after starting the first days trek through the forrest Josimar Marubo spots evidence of unocntacted people marking their passage through the amazon. FUNAI official and expedition leader Bruno Pereira leads the process of documenting the evidence (deliberately broken and bent over foliage and small tree saps). Bruno was insistent of the indigenous people on the expedition learning how and taken charge of documenting the evidence involving taking photographs and documenting the GPS locations of the evidence. Young Korubo boy Xikxuvo Vakwë carrying a hunted Sloth towards the evening camp during FUNAI's expedition through the Vale do Javari. Funai official and FUNAI expedition leader Bruno Pereira plucks a bird with young Korubo boy Seatvo. The expedition team had travelled up the Rio Sapota hacking their way through fallen trees and travelled the last section in heavy rain before arriving at their expedition starting point. The bird, a Mutum, was spotted and shot along the route. FUNAI expedition team member Marcir Ferreira, 49 preparing the second nights camp within the Vale do Javari. He is carrying wooden trust in order to support hammocks. Members of the FUNAI team wash after the 4th days trek through the Vale do Javari. The days schedule was: wake up 5am, breakfast and decamp by 7am. Start trek until midday and rest. Trek until around 3pm and set camp and make diner, wash and dry clothes in the evening. Sleep in hammock by 8pm. Macaco-Barrigudo's are prepared for cooking during the evenings camp by the Korubo members of the FUNAI team. The monkeys had been hunted earlier that day and are a common food stuff for Korubo people. Mutum bird hunted during the expedition is cooked on the fire during the evenings camp through the Vale do Javari. A young Macaco-Barrigudo is prepared for cooking during the evenings camp by the Korubo members of the FUNAI team. The monkeys had been hunted earlier that day and are a common food stuff for Korubo people. Young Korubo boy Xikxuvo Vakwë with a Macaco-Barrigudo or 'Fat Bellied Monkey,' which had been hunted during the days treks through the Vale do Javari. Korubo members of the FUNAI expedition team prepare the Hunted Sloth for cooking pot during the trek through the Vale do Javari. FUNAI team members fishing for river Piranhas during the expedition. During the FUNAI expedition food was hunted throughout the trip. A wild Bore was spotted feeding in a small ditch. It was shot, carried to that evenings camp and prepared for cooking. Takvan Korubu carries the Wild Bore to the evenings camp. Lëyu Korubo holding the wild honey that they found during FUNAI the expedition within the Vale do Javari. Lëyu Korubo carrying a hunted Wild Bore after a days trekking in the area looking for signs of uncontacted people. Members of the FUNAI expedition team clear the fallen tree which was preventing the navigation up the Rio Sapota towards the starting point of the expedition to trace the movements of uncontacted people. This particular obstruction took 1 1/2 hours to clear. The Marubo village of Rio Novo. Dogs are kept as pet but also serve as a useful alarm about intruders. Two young Marubo girls and friends Iskasharoo Morubo (left) and Sheta Marubo (right) inside the Rio Novo village Moloca. Funai official Bruno Pereira shows Marubo villages at Rio Novo documentary footage of tribes in the Javari Valley. Young Marubo children play and make waist and wrist bands inside the Maloca in the Village of Rio Novo. Young Korubo women in Chief Xikxuvo Korubo moloca. The Funai expedition team sit down to eat inside the Rio Novo village Moloca. After three days travel by water and some 500k down the Rio Itui members of the Funai expedition arrive at the Marubo Village of Rio Novo and are served a meal including Turtle by their host in the Village of Rio Novo. An traditional Indigenous practice of snorting tabacco. The tabacco in placed into the tube and blown into the nostrils by a partner. Alsino Marubo blows tabacco into Carlos Marubo. Rio Novo. Marubo children Kai (left) Metsis (middle boy) and young girl Vena (right) in the village of Rio Novo. Frankie Genesio Marubo (aka Francine) talking on the radio in the Marubo Village of São Joaquim. Radio communication is the only method of communication that the indigenous people have along the Vale do Javari. Members of the Morubo and Korubo tribes at a meeting organised by Funai's Bruno Pereira in order to discus the expedition and talk about the movement of uncontacted poeple within the area. Rio Novo. After the arrival of FUNAI official Bruno Pereira, Son of Korubo Chief (Xikxuvo) Takvan Vakwë and member of the Korubo tribe speak with Bruno about the movement of uncontacted people and the needs (for healthcare and education) for his village alongside the Rio Itui. Marubo children run back to the village after bathing in the river, Rio Novo. The Korubo Village alongside the Rio Itui where the Funai expedition teams stayed on the return back up the river to the FUNAI base. Bruno Pereira (38) plots the FUNAI expediton route with the assistance of Marcir Ferreira (49). The Marubo village of Rio Novo. The health centre at the village of Rio Novo. Xuxu Korubo who 5 years ago made first contact with Funai workers.. Korubo village alongside the Rio Itui. Sheta Marubo holding a turtle that was caught on a fishing trip, Rio Novo. Marubo village of rio novo. Young Marubo girl Iskasharoo Marobu, Rio Novo village. Young Marubo children inside the Maloca in the Village of Rio Novo. Young Korubo boy Seatvo (15) takes a rest during the first days trek through the Amazon. Lëyu Korubo, Seatvo (15) and Korubo chief Takvan Korubo looking at a Sloth in the tree canpoy. The Sloth was shot and killed and later eaten during that evenings camp on FUNAI's expedition through within the Vale do Javari. Korubo Chief Xikxuvvo Korubo at the entrance to the Korubo village alongside the Rio Itui. Young Korubo Mother, Tananeloanpikit with her child near to the entrance to the Korubo village alongside the Rio Itui. 1/2 hours into the first days trek Josimar Marubo spotted two pieces of foliage that had been marked and turned over in order to mark a route through the area. Thought to be one month old this evidence was documented by the FUNAI team and was evidence supporting the presence and recent movement of uncontacted people through the area. FUNAI team member Daniel Mayaruna, 44 waits for the start of the days expedition looking for traces of uncontacted people within the area. The communal Moloca at Rio Novo. Alsino Marubo (35) and daughter Manichi relax in a hammock. Marubo village of Rio Novo. Lëyu Korubo having his hair cut in the villages of São Joaquim. Mashe Marubo outside her Moloca in Rio Novo. Young Korubo boy Seatvo (15) sits beneath a sign, made by a FUNAI team member, into a tree indicating the presense of 'friendly' people. Should uncontacted people enter the area in the future they would recognise this as non threatening. Seatvo is listening to Expedition leader, Bruno Pereira (38), explaining the route and the security of the group during the expedition. The group were to walk in a particular order (armed members at the front and back) should they come across uncontacted people they were to stand still keep together and will try to communicate with the people. A young Korubo women at the Korubo village on the Rio Itui, Vale do Javari. A young Korubo women Wio carries her child child Manisvo towards her Moloca. FUNAI Official and expedition leader Bruno Pereira makes notes early morning before leading the expeditions on their first trek through the Vale do Javari. The Funai expedition team after their intial 6 days expedition looking for signs of movement through the neighbouring forrest of uncontacted people. Left to right, standing Josimar Marubo, 30 Alsino Marubo, 35, Marcir Ferreira, 49 Daniel Mayaruna, 44 Takvan Korubo Lëyu Korubo Bruno Pereira, 38 Seated Xikxuvo Vakwë, Takvan’s adopted son, around 12, Lëyu’s Seatvo, around 15. The Funai base at the entrance to the Vale do Javari. Access to the reserve is restricted to indigenous people. The base is the centre for radio communications within the reserve, it is permanently staffed and each evening the watched tower is manned in order to guard the entrance to the reserve. The Funai base at the entrance to the Vale do Javari. Access to the reserve is restricted to indigenous people. The base is the centre for radio communications within the reserve, it is permanently staffed and each evening the watched tower is manned in order to guard the entrance to the reserve. Lucimar dos Santos Moros cook at the Funai base. 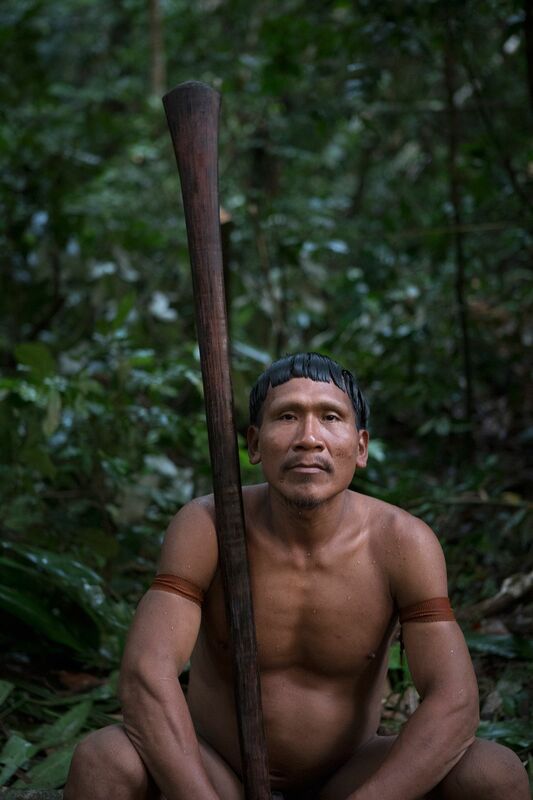 Travelling some 1100 kilometres by boat and 70k on foot through the Brasilian Amazon , FUNAI Official and expedition leader Bruno Pereira lead a team of Indigenous Marubo and Korubo people in search Brasil's uncontacted people within the protected reserve of Vale do Javari. The reserve was established, 1998, to protect the land from exploitation and create a lasting homeland for its people. It is one of the largest indigenous territories in Brasil and is home to some 6000 indigenous people, who share the land with 16 known isolated groups. There has been a history of mistrust, fear, and aggression between the uncontacted and indigenous tribes, but also one between the tribes themselves. A raid on a Marubo Village one month prior by two uncontacted men had created apprehension about their movements and intentions. FUNAI's aim was not to make forced contact but to to document their movements, possible shelters and to create a lasting working dialogue with the indigenous peoples within the reserve. For the first time Bruno Pereira created an expedition team of mixed tribal origins. The Korubo people are known locally as 'The caceteiros' or Clubbers after their fearsome fighting methodology. They have been largely credited with maintaining the reserves untouched wilderness condition by defending it from illegal invaders during the last century and most recently the actions of the illegal logging and fishing. The Marubo people are known for their diplomacy, large communal Malocas and sustainable plantations leaving very little impact on the local ecosystem. Entry to the reserve is restricted, controlled and guarded at the head of the Rio Itui by the FUNAI base.